Tumbleweed is resting in what sounds like a lake of champagne, snapping shrimp are making a constant popping sound that calls to mind celebratory bubbly more than weird critters drifting in the dark. A nice welcome to Opua. Seven months after leaving La Paz, Mexico Douglas and I are both still a bit awed by the realization that we have been at sea the past half year, moving steadily across the Pacific Ocean. We have explored the islands of French Polynesia, visited Suwarrow of the Cook Islands, anchored at at Pago Pago in American Samoa before digging in deep for a two months in the Vava’u group in Tonga. So many great adventures over these past few months, excellent sailing, beautiful wild anchorages and making new friends. At this point it is all a high speed collision of visuals in my brain and will probably take some time to find order. It feels really good to be here, to be at rest for a bit and to collect ourselves. Douglas on the last few miles of our passage. Flying the Q flag and about to drop the trys'l. That's New Zealand over his shoulder. Look - fog! Haven't seen that for awhile. The passage from Tonga to New Zealand was one among the finest we have had. We left Tonga on a perfect afternoon and had a day of ideal sailing, water as flat as a lake, broad reaching under a clear blue sky. We made our way south from Tapana through the Vava’u group, weaving our way through a collection of small islands with waters that shimmered electric through various shades of green and blue as they shallowed on to golden beaches. A magic sendoff. Sailing from Tonga to Opua pretty much directly, on the rhumb line, took a little over 1200 miles and eight days. The first 6 days we had strong winds, 25 knots gusting to the low 30’s with fairly organized seas, swell running 2-3 meters, wind on the beam. Ideal conditions for Tumbleweed we sailed mostly with a double reefed genoa and a trys’l, making an average of 7.5 knots, near hull speed for us. It was thrilling sailing, the view from the cockpit was like seeing a massive battering ram slamming into the sea, large sprays of water hitting the foredeck and running back along the cabin top. I spent a great deal of time standing at the stern arch, an arm locked around the bars as we bashed along, feeling the impact of each wave as Tumbleweed would shudder and then gather up speed again, occasionally racing over 10 knots as we surfed down a wave. 30,000 pounds sliding with some grace down the face of a wave was very cool. We had a near full moon waxing at the beginning of the trip and it was a friendly companion to the night watch. Rotating through our 3 hour shifts with the light of the moon shining on the sea, watching waves break in the distance made of silver by the moonlight was unforgettable. Nights we had cloud cover the moon would hide and dim for a while then come back unexpectedly, shining like a street light. It was bright enough to move about above deck without a headlight and nearly enough to read by. It is 65 degrees, raining and blowing a gale outside today with winds in the 30’s gusting to 50. I am happy to be in New Zealand but feeling a little wistful for Tonga and the ability to hop overboard for a quick swim. There have been a handful of adjustments to getting used to being in New Zealand. Weather high on the list, also traffic, high population, grocery stores filled with all we desire. Most of it is great but there is a strong appeal to the slowed down island life in the south pacific. Douglas flew back to the states to visit his father and I took the bus to Auckland with him. It was shocking to be in a place that with so many people and cars and what felt like chaos after so many months wandering around small outposts. We lived in Auckland for a few months about 15 years ago and kept pointing out the changes. The city has developed rapidly in those intervening years, cranes are busy on the skyline, traffic congests the city core, the sidewalks are dense with people dressed for business. Many neighborhoods have been transformed with restaurants, shopping, and corporate buildings. Feels very much like parts of Portland or Seattle. So many excellent looking coffee shops and restaurants. Downtown feels cosmopolitxan with a high mix of people from all areas of asia – South Asia, SE Asia and China, making for a diverse and lively restaurant scene. We had lunch at Mekong Baby, an outstanding Vietnamese joint on Ponsonby and dinner at Cassia, a dialed in restaurant serving next level Indian cuisine. Both meals were excellent, so much better than any place we have eaten in the past couple of years. The restaurant scene has exploded and become much more sophisticated than I remember from our last visit. As in Portland and Seattle, high design and refined cooking seem to be leading the scene. Douglas will be gone through to start of the New Year, he’s only been gone two days and life aboard Tumbleweed feels so different. I am trying to not miss him yet, to work on a scale of some sort, so that I can miss him a little this week, a little more next week and so on until January. To start off missing him greatly at this point will not be sustainable. View from Opua hill looking out to the Bay of Islands. I’ll be working on various boat projects. There is a long list to tackle, nothing major thankfully, but plenty of small things we’ve put off waiting for New Zealand and easier access to parts and supplies. When we were in Auckland we wandered through a chandlery for 15 minutes and then fled, I think it was too overwhelming to have so much choice. And we wanted to make time for the excellent maritime museum. Highly recommend visiting the museum, quite the collection of history from life on the seas. From the immigrants who arrived by sea – Maori with their sea canoes, Europeans on various types of ships – to the contemporary racing scene – the yacht that won the America’s Cup is on display in a vast hall with all sorts of displays on various racing efforts. Super cool. There is also a section filled with sailing dinghies, some gorgeous classics included. The museum was not built when we were there last, it looks new and nicely done. High marks. The bus ride from Opua to Auckland is about 4 hours and goes through mostly rural farm land on a two lane road. Opua is in the sticks, surrounded by small farms, with plenty of rolling green pastures, sheep, cows, horses. Pretty low key. No sign of the thousand acre mega farms I’m used to seeing back home. Maybe they are inland? On the south island? Do not exist? The green, green hills of New Zealand. From our ride into Auckland. We are still trying to figure out our next moves once Douglas returns from the states. Wellington is looking inviting and we are looking into making that our base. Summer should start kicking in here in a month or so and will make for nice sailing heading south. We plan to be based here for a year if we can make that work. From the day we arrived. The water is mostly very still in the marina with the non-stop crackle of snapping shrimp it's a nice spot to be at rest for a bit. 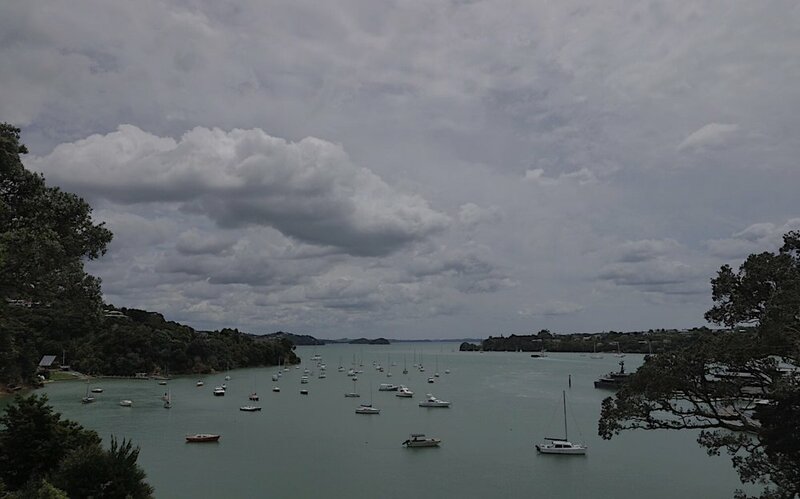 But for the next couple of months Opua is going to be a great base to work on boat projects and explore the area. 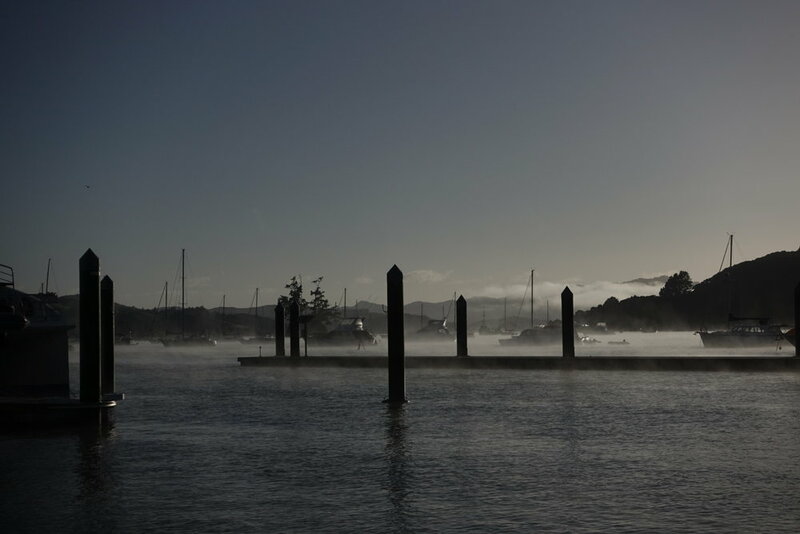 We have visited Paihia a couple of times, it’s a small village about 10 minutes by car or 2 hours walk along the water. KeriKeri is the “Big” town about a half hour away and I’ll check that out soon. Russel is another small town nearby, a ferry ride away from Paihia, also on the list of places to visit, it was the original capitol of New Zealand and sounds interesting. Once the weather settles down I’ll put together the kayak and explore the bay.